Sometimes the strangest stuff can end up in your hair. Toothpaste can get stuck in hair if you are brushing your teeth and aren't paying attention, or if you're at a kids' party or special function with crazy games and the like. 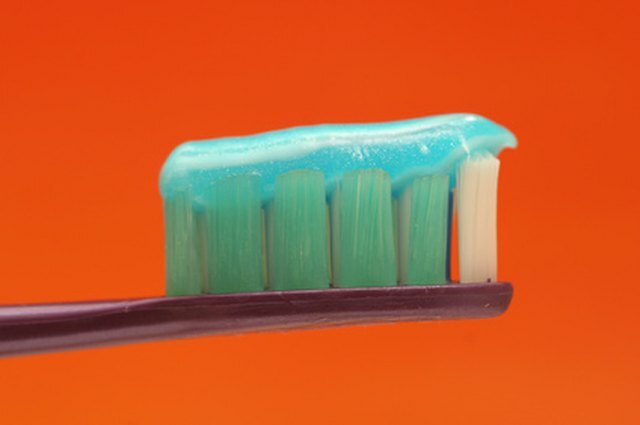 While sometimes there's no telling why toothpaste ends up in hair, it is relatively easy to remove. The real trick is keeping the toothpaste-coated strands away from your other hair to avoid additional clumps of sticky mess. Separate the hair covered in toothpaste from the rest of your tresses if possible. Holding hair with your hands is one possibility if you have easy access to a sink or shower. Use hair ties or clips to move it away from your other hair if this is not an option. Blot the toothpaste with a paper towel or cloth should you have to wait to use a sink or shower. Blotting will remove some of the toothpaste. Avoid wiping your hair with the paper towel/cloth as this will smear the toothpaste into more of your hair. Gently rinse out the toothpaste with warm water in a sink or shower as soon as you can. If it does not appear to be coming out simply add shampoo, which should completely remove all toothpaste that hasn't dried. Shampoo hair once or twice if toothpaste has dried in your hair. Use a wide-tooth comb to make sure it has all been removed before rinsing. While toothpaste can be messy to remove from hair it works well in getting hair dye color off the skin due to its abrasive ingredients.